Often overlooked by the Ostara 26,32 and 38mm 2″ SWA-70 eyepieces, the Ostara 30mm SWA 2 inch eyepiece is a hidden gem in the middle of the pack. Featuring a very solid 420g body with 5 element fully multi-coated optics, you get a lot of eyepiece for your money. 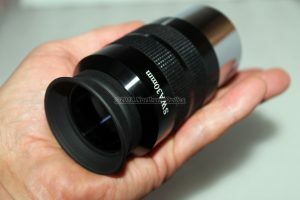 Designed to give an excellent wide field of view, making it perfect for galaxies, nebula and rich field star clusters. Comes in 2″ barrel size only and threaded for 2″ filters. Complete with twist type bolt case. Long eye relief for spectacle wearers (fold down eye cup). Other features include a rubber grip and good internal baffling to reduce stray light. This entry was posted in Eyepieces and tagged eyepiece, ostara. Bookmark the permalink.